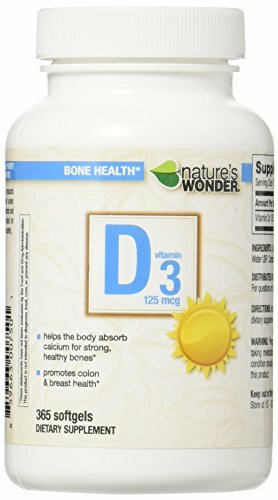 Nature’s Wonder Vitamin D3 125mcg. Supports strong bones. Equivalent to 5000IU. Vitamin D3 helps the body absorb calcium and is known for its beneficial effects on strong healthy bones. Recent studies have shown vitamin D3 can also aid in maintaining breast and colon health.